So many times, I think of something I want to say, but I can never really formulate it into a full post. So, I'm hoping to have a weekly article with all of my, weak thoughts. Enjoy! Buster Olney, on the anniversary of Ryan Braun's admission and suspension for PED use, has put together an article highlighting how Braun is a different hitter than in previous years. I'll admit, fairly topical, and certainly noteworthy, so what's my problem with it? It's the implication. Olney points out that so far in 2014, Braun has gone to opposite field much more than in year's past. Also, the balls Braun has pulled, have had less distance. .... Olney leaves the rest up to you, stopping short of suggesting Braun, now clean of PED's, is not the same player he was with PED's. Olney does of course mention Braun is having a great year, but it's almost a side thought. The evidence sounds damning, but take into account Braun's lingering injuries, most notably the damaged nerve in his thumb. Usually player's receive high praise when injury forces them to change up their approach and still succeed, but not Braun. With all of that said, I'm not necessarily defending Braun, it's been rumored he was taking PED's for a nagging injury (which he seems to be prone to), so perhaps this adjustment is still a result. But let's give some credit to a player having a terrific year and making necessary adjustments to help his team win. Yes, I do have a thought about the Bucks. Don't be alarmed, I'm not sick. I have half a notion to start caring once more about the Bucks, and thus in turn, the NBA. I have very mixed feelings on this. I grew up as many kids of my age did, a fan of the Jordan Era Bulls. Then, as I got older, I became a fan of the hometown team. I got to experience the electric atmosphere as the 2001 Bucks beat the Hornets at the Bradley Center, this is OUR HOUSE! Then, the series against the 76'ers came. You can read about it in Bill Simmons' "The Book of Basketball's Lost Pages" under item 10. NBA was dead to me. It was clear (to me) the game was rigged. Of course, in the years after we learned of one referee fixing games as a debt to the mob, but that to me, seemed like it wasn't the whole story. Plus, the Bucks were mired in terrible mediocrity, and had little interest in making splashes. Now, the Bucks have new ownership, and hopefully that means a new direction. 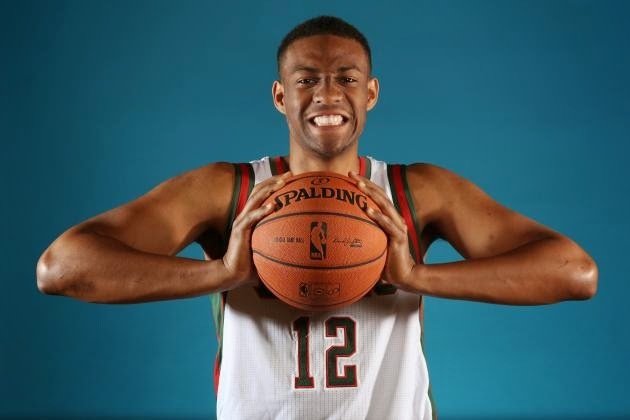 While his NBA talent is still unknown, Jabari Parker is a flashy draft pick, and he's said all of the right things, which gives me hope there is a base now to build off of. This almost feels like Mark Attanasio taking over the Brewers and having some young prospects named Fielder and Braun start to showcase their abilities. I was on that train from the beginning and it's been a fun ride. Perhaps I want to jump on the Bucks now, and enjoy the same thing? I was not a fan of the Jason Kidd hiring, nor a fan of how it was handled....but who knows, no risk, no reward. Plus, I really need something to do in the wintertime! I've tried to get into hockey, a sport that is super fun to watch....but minor league hockey is hard to get into. I've accepted Milwaukee will not get an NHL team, so I might as well enjoy the NBA team......maybe. Ouch on that end of the 1st half! It felt like the Brewers were just going to put it on cruise to the playoffs, just keep those 10 game splits in the positive and the Central would be ours. Well, the lead has evaporated, and now the battle is on. I think everyone is done moping about it (I hope). So, let's enjoy being in a real playoff race, 4 teams vying for crown of NL Central Champs.....baseball just got a whole lot more exciting for the final few months! Get out to the Park, avoid the fires and cheer on the team! This reminds me, I need to get to another game. lying taste to them that I can't explain. It's smooth, it's mellow, it's freaking delicious! Well, while in West Palm Beach I came across a beer of theirs I haven't had yet. 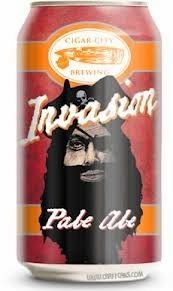 Invasion Pale Ale. It's a session ale, so the low alcohol was handy since I was drinking all day in the sun, but the flavor was still very present. Great hop taste, with a good malty balance. Ashoka Packers and Movers in Kukatpally, Hyderabad, is giving moving answer for a long time with the expert help group. Our administrations are highest in the city contrast with other specialist co-op and make each migration bother free in Kukatpally. We serve the clients administrations with our best help and make each movement with our accomplished group. Our most mainstream administrations are home moving, vehicle transportation, warehousing, mechanical products moving, office movement from one city to other at the best cost.